The Light Rail Efficiency Project’s goal is to advance major improvements intended to increase speed in VTA’s system and ensure its ability to handle projected ridership growth. This growth will be driven by three factors: 1) the new 68,500-seat 49ers Stadium in Santa Clara; 2) the expansion of BART service into Santa Clara County; and 3) anticipated large-scale development along the North First Street Corridor. This project provided planning and alternatives analysis, conceptual engineering, and preliminary engineering to 35% design for four interconnected system areas: the Tasman Midline Improvements Project (serving the 49ers Stadium); the Tasman Express Project, the Guadalupe Express Project, and the North First Street Speed Improvements Project. 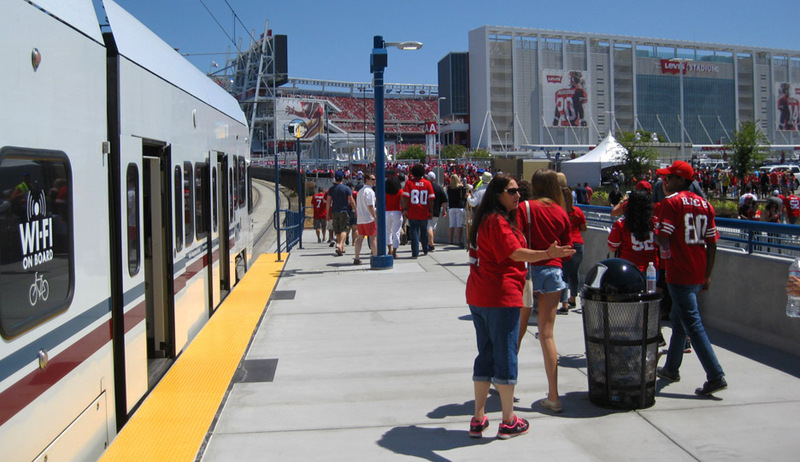 CHS Consulting Group performed LRT operations analysis, analysis of pedestrian queuing stations, and an access study for Levi’s Stadium in Santa Clara. The operations analysis examined service and operating plans; train layover and storage capacity; traffic signal programming; bus layover and boarding capacity; station relocation and configuration; and interfaces with motor vehicles, pedestrians, and bicyclists. Traffic analyses accounted for the capability of the traffic signal system to accommodate a higher level of transit signal priority. Analyses considered demand associated with San Francisco 49ers football games, as well as with other stadium events and attractions. Among the options studied and recommended are: 1) a pocket track to permit storage of trains serving special events; 2) a revision of the track configurations at the Mountain View terminal to improve throughput and the transfer of passengers to and from Caltrain; and 3) double-tracking the line to increase its capacity and reliability.Subsequently, CHS completed a TIA report and IS/MND for the project, addressing existing and future transportation conditions and assessing transportation impacts.